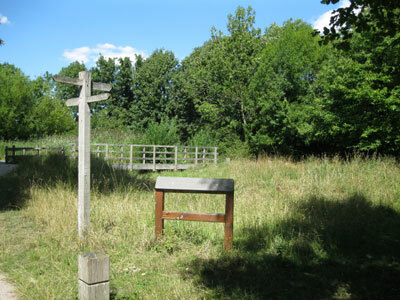 This ride uses Sutton's extensive cycle network to explore the borough's open spaces, many of which began their lives as country estates. The total distance is about 13.5 km / 8.5 miles. Although you could do the whole ride in an hour, it will more likely take half a day if you stop a few times. You can start the ride at Cheam or Carshalton station and finish it at Carshalton or Hackbridge station. These stations are all on the same line. Outside the peak hours, you can take your bike free of charge on the trains serving these stations. If you intend to travel on a Sunday, it is advisable to check on www.nationalrail.co.uk that the line is not closed for engineering works. Before the suburban expansion of the inter-war years, Sutton was still largely a rural area, dotted with country houses. Many of these became public parks, which still retain some of their original landscaping and buildings and which you can visit on this ride. Sutton has implemented an extensive network of cycle routes that allow you to cycle between the spaces included in this ride. As well as avoiding busy roads and junctions, the routes take you through interesting backwaters and across some of the parks. Leave Cheam station through the exit from the platform served by trains from London. Ride straight ahead along Station Approach and turn right at the T-Junction into Upper Mulgrave Road. At the end of this road, turn right into Sandy Lane (signposted 'Cheam Village'). Pass under the railway and take the second left (Kingsway Road). At the end, turn right into Anne Boleyn's Walk. At the junction with the main Ewell Road, use the toucan crossing to the left and then turn left, following a cycle track through some trees. To your right, there is an occasional view of Cheam Park through the trees. Continue to the gate of Nonsuch Park. Enter the park and ride along the drive for about 300 metres, until it is blocked by a barrier. Turn right towards Nonsuch Park Mansion. Ignore the right fork towards a car park and follow the path straight ahead and then left around the front of the Mansion, where there are cycle parking stands, a café and toilets. The gardens lie behind the Mansion. The Nonsuch Mansion, an 18th century house, itself possibly built on the site of the Keeper's Lodge to Nonsuch Palace's Little Park, was rebuilt by architect Jeffry Wyatville in the picturesque gothic style in 1802-6. The present house has a castellated brick wall down one side and the gardens, which were partially laid out by Thomas Whately c.1830, feature a rose walk, sunken shrubbery, trees and flowers. The Friends of Nonsuch open the service wing of the Mansion in the afternoon of the 2nd and 4th Sundays of each month plus bank holidays from April to September. Facing the front door of the Mansion, take the path to the right, marked by a cycle route sign. The path curves left, back towards the main drive through the park. At the junction with the main drive, ignore the cycle route sign pointing left and turn right along the drive. About 900 metres further on, the drive turns right. 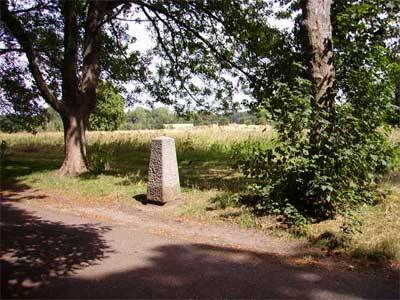 The site of Nonsuch Palace is marked here by three concrete obelisks. Henry VIII began work on Nonsuch Palace in 1538, re-using material from the dissolved Merton Abbey. The Palace was adorned with panels of moulded stucco by Nicholas Bellin of Modena (who also worked for François I at Fontainebleau) and with gilded carved slate. Completed after Henry's death by the Earl of Arundel who purchased the estate in 1547, it reverted to royal ownership in 1592, remaining so until Charles II gave it to his mistress Barbara Villiers in 1670, created Baroness Nonsuch, Duchess of Cleveland. By this time, the palace was becoming dilapidated and she eventually sold off the land to pay her gambling debts, and demolition of the palace began in 1682. In 1959 the site was excavated by the Museum of London. Return straight along the drive to the gate and follow the cycle track back to the junction with Park Lane, just past the toucan crossing. Turn left along Park Lane. On the left there is a lodge at the entrance to Cheam Park. The 18th century house in Cheam Park was bombed during WW2 and subsequently demolished, but the lodge of c1820 remains plus part of the old kitchen garden wall. Cheam Park House and its grounds had been purchased by the local authority in 1937 for public use. 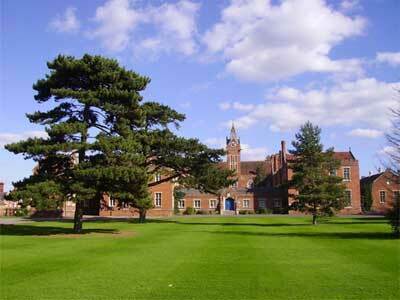 The site adjoins Nonsuch Park and is in two parts, the recreation ground to the north, which has meadowland areas and the ornamental gardens. There are old oaks and yews, an overgrown pond and remains of landscaping in the park. Some trees date from Victorian times. Shortly after the lodge, take the turning on the right ('West Dene' on the corner), past some old cottages on the right and the back garden of Whitehall on the left. 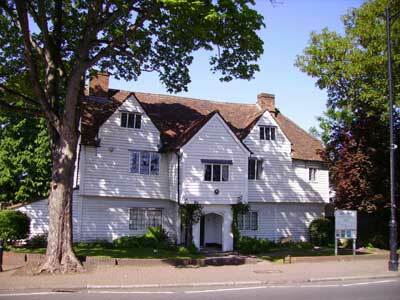 Whitehall is a large timber-framed house dating from about 1500 and restored in 1975-6. Open Wednesday to Sunday afternoons and Saturday morning (small fee). Free admission to the tearoom and shop. Cross the main Malden Road using the pelican crossing and follow the cycle track to the left and then round the corner into Park Road, on the right. Just after passing the Olde Red Lion on the right, bear left and right into Love Lane, following the cycle route signs for Sutton. Crossing the Sutton By-pass, you will see Seears Park to the left. 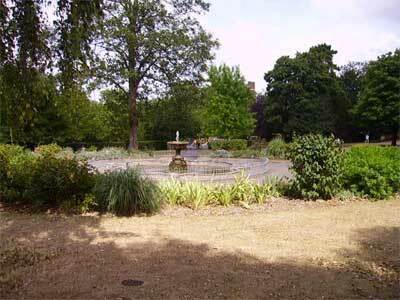 Seears Park was originally part of Hammond's Orchard, itself part of East Cheam Manor estate. Laid out as a park by John Seear c. 1890-1912, it was left to his wife and then to the local authority on her death (1932). There remain some mature ornamental trees from the 19th century, including a monkey puzzle, redwoods and firs along the main road to the west, also some broken statuary and a pond from the same period. The drinking fountain was added in 1932 as a memorial to the Seears. There is an attractive ornamental cottage in the north-east corner. Take the alley facing you to the right of Seears park. After about 100 metres, turn right into another alley and then left into Quarry Park Road, following the signposts for Sutton. At the junction with the busy (but unmarked) Gander Green Lane, go straight ahead past a small supermarket and turn left into Tate Road. Continue straight ahead along an arm of Western Road and across a mini roundabout. At the junction with Sherwood Park Road, go straight ahead into Camden Road, using the contraflow lane. At the end, turn right into Robin Hood Lane (unmarked, but signposted 'Carshalton'). Use the contraflow round the bend to the left into Gibson Road, where the graveyard of St Nicholas' Church is on the left. When the old parish church of Sutton was deemed too small for its growing congregation, St Nicholas' Church was rebuilt by Edwin Nash in 1862-4. 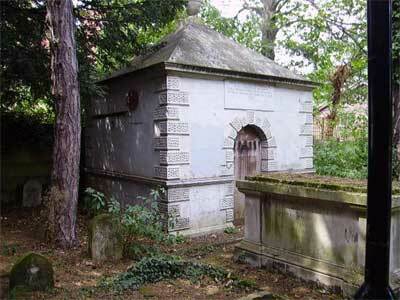 In the churchyard are many tombs including a mausoleum (1777) to citizen and merchant James Gibson and family. The structure has a pyramidal roof, rusticated quoins and door surround. Cross St Nicholas Way using the toucan crossing and ride up the hill to the right along the cycle track on the pavement. Turn left into Hill Road, where there are a number of bars and restaurants and follow the cycle track down the hill to Sutton's High Street. (Cycle shops further down the High Street: Pearsons on the right, Halfords on the left.) Cross the High Street and go up Throwley Road opposite to the junction with Throwley Way. Manor Park is facing you across Throwley Way. There is a café in the corner of the park. Manor Park was originally the site of Manor Park House and three other large suburban houses and their respective grounds that were acquired by the local authority. The pleasant public park was laid out from 1914 on a sloping site with Sutton's war memorial, dating from 1921, at the top. This park is sub-divided into areas by hedges and fences. Many of the trees in the park, which include firs and deciduous trees, are mature or semi-mature. 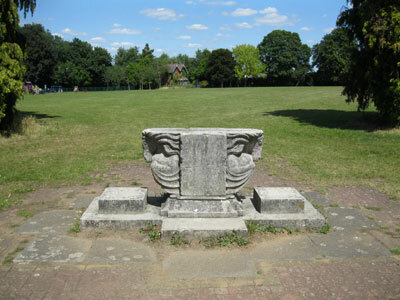 The large fountain in the south park enclosed within simple iron rails and gates was donated by Cllr Charles Yates, Chairman of Sutton UDC in 1924-25. Ride down Throwley Way, using the cycle track marked on the pavement on the left-hand side. Cross the road at the toucan crossing and continue to follow the cycle track down the hill and round the corner to the right into Greyhound Road. Turn left into Lenham Road, right into Manor Lane, left into Nursery Road and right into Benhill Avenue. Ignore a cycle route going straight across into Benhill Wood Road towards Rosehill. Turn left between the two mini roundabouts into Lower Road, which later becomes Westmead Road. At a mini roundabout near a low railway bridge, turn left into Colston Avenue. At the mini roundabout at the end, turn right into Carshalton's West Street. Go under the railway, passing the road to Carshalton station on the left. If you are starting from Carshalton station, go down the hill to the right as you leave the station. Turn left into West Street at the bottom. Continue along West Street, ignoring a cycle route to the left through West Street Lane. Stop opposite the Water Tower, which is on the right. The house, now St Philomena's School, was built in the early 18th century by Edward Carleton, a tobacco merchant, who went bankrupt in 1713. In 1716 the house was bought by Sir John Fellowes of the South Sea Company, who himself went bankrupt in 1720 but by then he had laid out the grounds, employing landscape gardener Charles Bridgeman, and built the Water Tower or Waterhouse. As well as a cistern supplying water to the house, the Tower accommodated a large marble plunge bath, a pumping engine and an orangery. 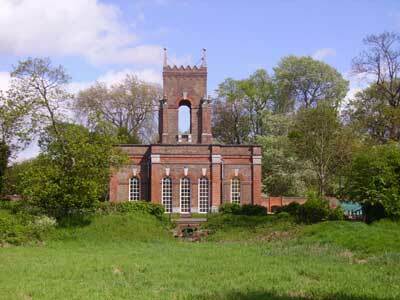 Carshalton Water Tower is open on summer Sunday afternoons (small entrance fee). Walk along Festival Walk, opposite the Water Tower, as far as the pond. The entrance to Ecology Centre is on the left, while the Heritage Centre, with a café, is on the right, facing the pond. Continue straight ahead along Honeywood Walk, with the pond on your right and passing the war memorial on the left. Cross North Street and enter Carshalton Grove through a gate in the wall a short way to the left. Walk along the path to the right towards the pond and cross the bridge, with a fine view across the pond to the church. After crossing the bridge, take the path to the right along the edge of the pond. Turn left on reaching Carshalton High Street (opposite the Woodman wine bar). After a short hill, the street passes through a pedestrian crossing. 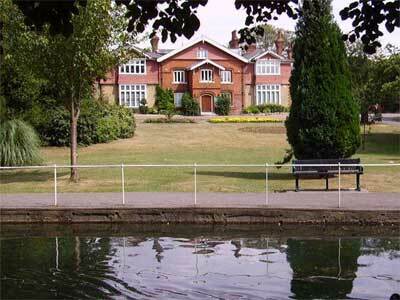 Part of the centre of rural Carshalton, the public park with an ornamental pond was once the grounds of The Grove, a private house built c.1840, which from the early 19th century had incorporated part of the former lands of the Stone Court Estate that were east of the Wandle river. 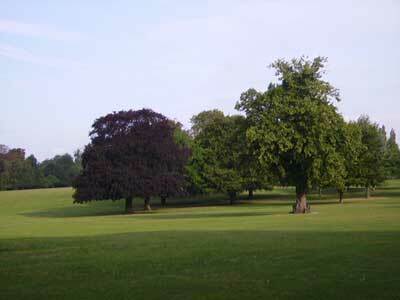 The Grove was purchased by Carshalton UDC in 1924, and the recreation ground was formed out of the grounds. A short detour can be made to Carshalton Park. Follow the dried-up canal along the side of Carshalton Place, a turning on the right off the High Street. After Talbot Road, the road becomes a path. At the end of the path, cross Ruskin Road and enter Carshalton Park. 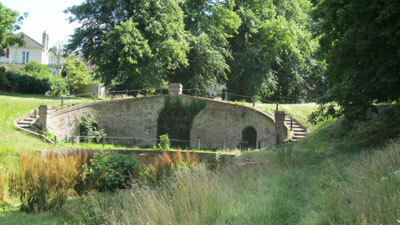 Make your way up through the park, following the canal as far as a brick grotto at its top. Return afterwards to Carshalton High Street and turn right. The next street on the right, Carshalton Place, perpetuates the name of a house that once stood to the south of the High Street and was demolished in 1927. A dried-up canal at the side of this street once carried water that emerged from the grotto in Carshalton Park (see below). 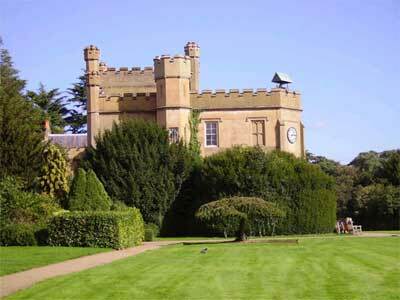 Carshalton Park is a former medieval deer park and once part of the extensive Carshalton Park Estate owned in the early 18th century by Sir William Scawen, ex-Governor of the Bank of England. The estate was inherited in 1722 by his nephew Thomas who continued formal landscaping works although never completed the new house. Features surviving from the 18th century garden include the large grotto and ornamental canal of c.1724; also visible are a circular depression (probably 19th century) known as the 'frying pan', and the Hogpit Pond, a rectangular pond with sloping grass sides built as a reservoir to supply water for mills down Mill Lane. Today the park is largely laid to grass with tarmac paths and some mature trees. Continue along Carshalton High Street, passing the Charles Cryer Studio Theatre and the Fox and Hounds pub on the left. After another pedestrian crossing, turn left in Westcroft Road. Continue straight ahead through the road closure (sign-posted 'Beddington Park'), ignoring the road to the leisure centre on the left. At the bottom of Westcroft Road, turn left into London Road, immediately left into Butter Hill and immediately right onto the cycle track between a small lake and the road. Cross London Road, and turn left along Lakeside, at the back of the second lake. At the junction with Derek Avenue, ignore the cycle route to the right, signposted 'Beddington' and 'Croydon'. Cross Derek Avenue and use the cycle track along the pavement to the left and then round the corner and along the right-hand side of London Road. After crossing the river, turn right into a car park. At the back left of the car park, you can enter the gardens of The Grange. The Grange was the home of Alfred Smee FRS. The garden he created was very fashionable in the 1860s and the plan and details are recorded in his book My Garden its Plan and Culture (1872). The original rockery survives in a diminished state and most of the garden including the pergola and lily pond is late 20th century. The house, built in the garden by Smee's son, was destroyed by fire in 1960 and replaced by the present restaurant in 1967. The ride continues along a cycle track at the back right of the car park. Follow this path, which enters Beddington Park after about 100 metres. 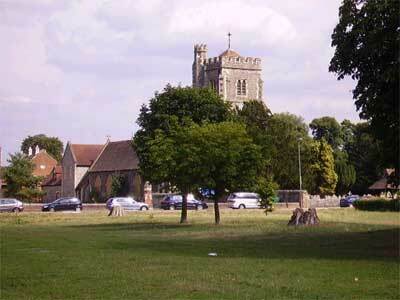 Continue to follow the path parallel to the southern edge of the park as far as Beddington Church. Beddington Park was once the deer park for the Carews who came to Beddington in the 14th century and held the estate until 1859. On reaching the church, turn left along the road, passing Carew Manor on the right. Carew Manor House, originally built in the 15th-16th centuries, was the home of Sir Francis Carew, whose gardens were famous in the 17th century. 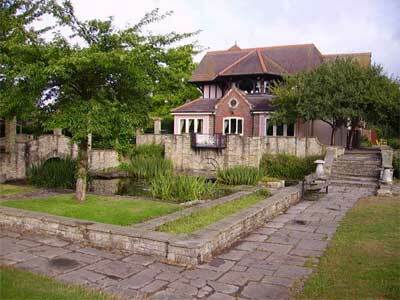 They included waterworks and an orangery, which was said to be the first in England. All this has gone but several 17th and 18th century walls survive, including a long orangery wall with blank arcading divided into pairs by pilasters on the north face. The Manor House is now a school. Guided tours take place on a number of summer Sunday afternoons. Call 020 8770 4781 for details. At a polygonal black-and-white lodge, a road forks right towards the dovecote and other outbuildings. Take the fork to the left onto the cycle track. Cross the river and continue straight ahead, with the cricket field and later the Parkside Café on the right. Follow the path around the park to a gate onto London Road. Turn right along London Road. The entrance to Hackbridge station is on the right, just over the bridge. Ride prepared by Colin Wing for the London Parks & Gardens Trust, 2007.